Gong Xi Fa Chai and welcome to the year of the Rabbit! Occupying the 4th position in the Chinese Zodiac, the Rabbit symbolizes such character traits as creativity, compassion, and sensitivity. Rabbits are friendly, outgoing and prefer the company of others. They also prefer to avoid conflict. In confrontational situations, Rabbits make peace.. not war! Well, I don’t totally believe in the Horoscope thing but I’m not complaining as it looks like it’s going to be a great year of calm and serenity for you and me.. and hopefully many peaceful, enjoyable meals with friends and family to look forward to. So far so good for Cumi & ciki, because here we are again, bringing you our second installment of the Standard Chartered Extravagant 8 Menu, an event organized by Standard Chartered for all its Credit Card Members. This time we are dining at Chynna, KL Hilton. 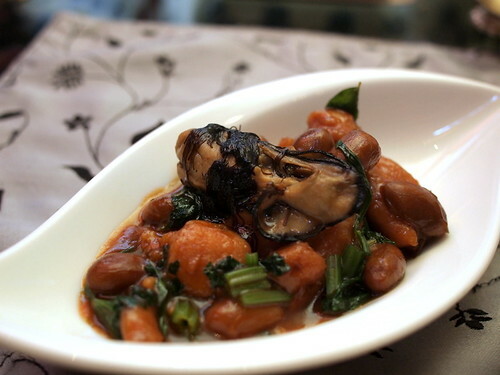 If you haven’t already heard, in conjunction with the 2011 Chinese New Year celebrations, top Chefs from 8 of the Top Chinese restaurants in Klang Valley will prepare the Extravagant 8 menus, between 20 January and 17 February 2011 exclusively for Standard Chartered credit card holders. Priced at RM888++ per table of 8 pax, Standard Chartered credit card holders will be able to indulge in this wonderful menu and the list of restaurants participating are amongst the top Chinese Restaurants in KL. These restaurants include, Li Yen, Ritz Carlton; Shanghai, JW Marriot; Celestial Court, Sheraton Imperial; Tai Zi Heen, Prince Hotel; Zing, Grand Millennium; Gu Yu Tien; Elegant Inn; and last but not least Chynna, Hilton KL. 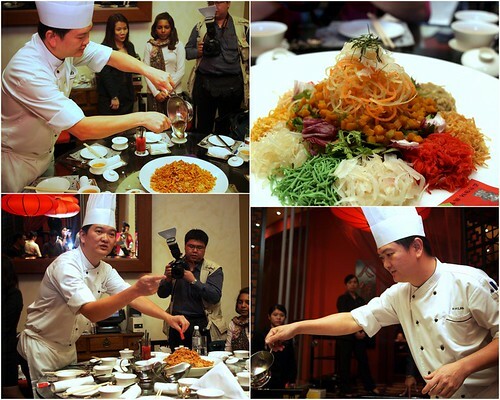 Here is Chef Lam Hock Hin from Chynna KL Hilton, demonstrating how to prepare the organic Yee Sang with great enthusiasm. The Chef was so enthusiastic over the tossing of the Yee Sang, that more of it ended up on the table than in the plate! The colorful mess was definitely a positive sign of good things to come. The organic twist on the Yee Sang was definitely a first of me. I found this Yee Sang light and refreshing. As the Yee Sang is organic, there is no fish involved whatsoever. So what gives the fish-like texture? 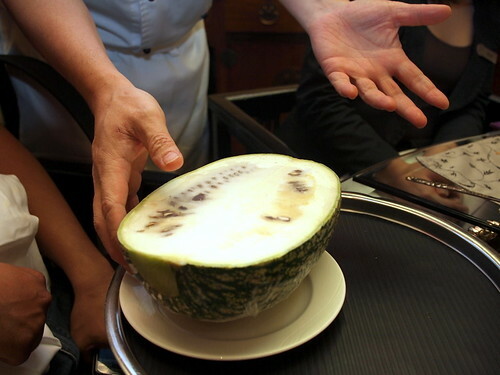 An organic melon (better known as “Sharks Fin” melon) takes the place of fish. Its name is such because it resembles shark’s fin. Of course not a single shark nor fish was harmed in the preparation of this Yee Sang platter. All these wonderful components including gold pumpkin cubes and colourful diced fruits, loads of toasted peanuts and sesame seeds are all toss together for good luck, health and fortune. This was a delightful soup. 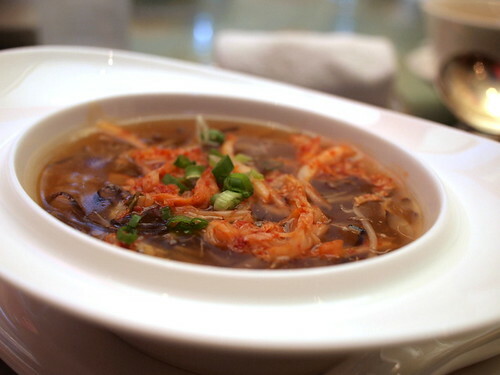 I loved the spin on the Szechuan Styled hotsoup as the Kimchi had a far more addictive, garlicky “zing” to it. Pretty ingenious. The fish was faultless. 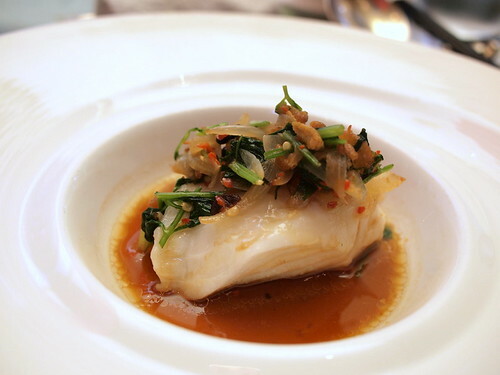 Toppings of dried shrimp, shallots and sauce that accompanied the dish brought out the flavours in the rich, white meat of the Cod. A decent dish but of pretty indecent proportions. Too small! I could have eaten another two servings of these, easy. It was that good. Strong and feisty as a dish , the dried oysters met the Fatt Choy (Black strands of prosperity) head on and produced a bold, “in your face” flavour, but in a good way. The crunchy vegetables balanced out the heavier flavours well. 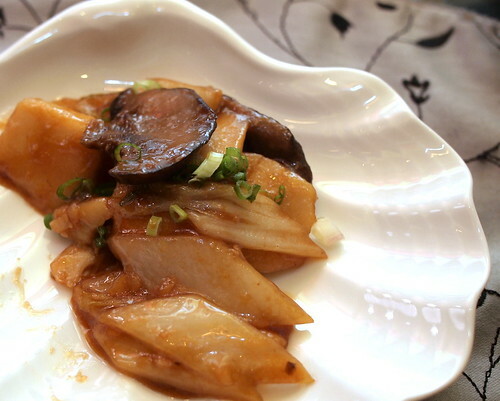 Wok Fried Shanghainese Nian Gao with cabbage and mushroom. I don’t like carbs but I ate all of mine, plus Cumi’s this time round. The Nian Gao (which is a stodgy, chewy carb of glutinous rice) was addictively tasty especially with eaten with the flavoured mushrooms and cabbage. 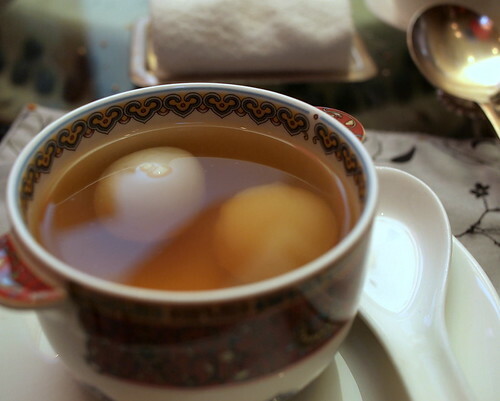 One of the Chinese desserts that I am pretty addicted to is the Tong Yuen a.k.a. sweet, round chewy dumplings filled with black sesame paste or ground peanuts. The black sesame ones are the best and once you take a bite out of your white shiny ball, and the black sesame filling oozes out of the dumplings, you will be hooked for life. Black sesame dumplings can be served either in hot ginger syrup or in soya bean. I have even recently experienced one variation served in red bean. They were all pretty good but my favourite is still the ginger. I love it for its biting sting. There is nothing quite like the burn of warm ginger soup, on a cold night. With all this rain Kuala Lumpur has been experiencing lately, is it any wonder why this is my favourite Chinese dessert. LOL. nian gao like chewy carbs. very nice! nom nom nomssssss… well done girl. Colombo? i thot u were in KL! Happy CNY! Wow what a feast! Must go and try the Canadian cod. Ah …. 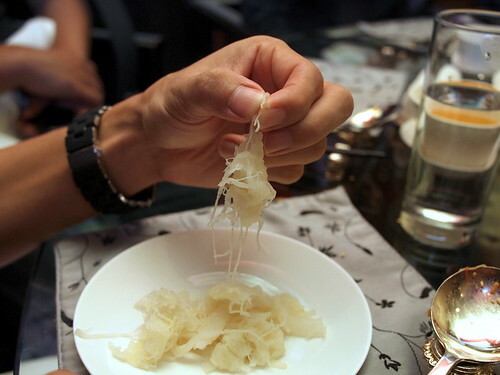 another sharks fin friendly restaurant …. I think most of the divers protest not to eat sharks fin anymore? Savoury nian gao! That’s the ONLY way to consume carbs! GONG XI FA CAI to you both! More monkeying around in the year of the rabbit, ya? woo hoo! happy year of the rabbit, rabbit! I loved the cod. So fresh and tasty. Happy CNY, cumi dan ciki!